A text produced during the successful 8-day occupation at Sussex University in March 2010. In the end, this text was not published at the time. It was discussed amongst a group of anarchist/anarcho-syndicalist students and staff, and decided that publishing the text would potentially polarise the situation and thus prevent the emergence of the very strategy advocated in the text. This partly because many of the leftists were not die-hard party liners (some weren’t even party members, while some joined during the occupation) but relatively independently minded and prepared to discuss strategy. Instead, it was decided to argue the central points of the text in the mass assembly that evening. The argument was essentially against a proposal to hold rallies/marches every day; as one person put it “I don’t care what you can call it as long as I can chant.” In opposition to this kind of empty sloganeering it was argued to focus on the content of our activity and specifically the space we held, which could be used to draw in those students and staff who opposed the cuts but who had been alienated by the activism of the Stop the Cuts campaign. This argument was largely successful. Instead of focussing on endless rallies and marches, a program of teach-ins were arranged. While leftist big-shots like Alex Callinicos (SWP leader) spoke, the program was dominated by staff. Some teach-ins were quite academic, but the most inspiring provided a space for staff to make public their feelings about the cuts that they had thus far had to bear as a private burden. The cartharsis was moving, and difficult to convey to those not present, but something changed in the character of the movement – or rather it ceased to be activism and became something like a movement. Parallel to the teach-ins it was decided to organise an Emergency General Meeting of the Students Union to pass a vote of no confidence in university management (the Vice-Chancellor’s Executive Group, VCEG). The main demand of the occupation was the reinstatement of the ‘Sussex Six’, suspended after an occupation the previous week where management fabricated a hostage situation in order to call in riot police with dogs. Several students were assaulted and two arrested, while six occupiers were suspended. The idea was alongside the direct action of the occupation, the ‘proper channels’ of the EGM provided an additional pressure on management. The EGM needed 600 students to be quorate. For context, the previous AGM had failed to reach quoracy, getting only 400 students. At just 48 hours notice, the EGM drew in 850 students with around a hundred more turned away with Mandella Hall already over capacity. The motion was passed near-unanimously. This seemed to reaffirm an assertion of the text below – that support was there, but alienated from the activism of the campaign. Together with the occupation, through which hundreds passed in its 8 days, this seemed to be the beginnings of the ‘massification’ called for. The day after the EGM, on the morning of the one-day UCU strike (Thursday 18 March 2010), the Six had still not been reinstated. Occupiers marched out at 7am to join the picket lines, unsure of what seemed an ambiguous outcome. Then the news filtered through – management had caved in and unconditionally reinstated the Six. Victory! But also, an end. The following day was the end of term, the massification that had begun was to be sharply curtailed and the nascent movement put on hold. Now then seems the time to publish this text, so that at Sussex and beyond we can critically reflect on what happened in those 8 days where so much seemed to change, only to suddenly return to normal. As students, workers – occupiers - to be part of a mass contempt of court, occupying Arts A2 in defiance of both university bosses and the British state has been an inspiring experience. But there is an elephant in the room. A clear majority of students seem to support the aims of the Stop the Cuts campaign, plus the majority of staff. But our biggest demos number in the region of 500, and staff, especially lower paid, more precarious support staff are conspicuous by their absence. There have been some steps taken to address this; a cleaner spoke to the occupation on Friday morning, and teach-ins have been arranged to try and attract more students. There are obvious reasons that staff threatened with job losses may wish to keep a low profile. But there remains some truth to VCEG’s accusation that the occupation ‘claims to represent’ the student body. As long as the student body is represented by a minority and not active for itself en masse, the campaign is largely limited to symbolic action, and management can attempt to weather the storm. So how then to grow the campaign? There are two answers to this question. The easy answer we all know, the other one needs to be collectively answered through debate and critical reflection on our successes and failings so far. The first answer sees the problem as one of mobilisation. Students are supportive, but not active. The task therefore is to door-knock and flyer, demonstrate and sloganeer, building one demonstration after the next of increasing size, turning passive support into active support. The problem is, we’ve been doing this and it seems to have reached its limits. Mobilisation certainly has its place in the campaign, but the demonstrations long ago hit a plateau and numbers even began to decline. It was VCEG’s repression with police and arbitrary suspensions which gave us back our momentum, swelling our numbers and allowing us to take Arts A2. So what is the alternative to the ‘mobilisation’ answer? First, we need to look at its assumptions. Fundamentally, the mobilisation approach is based on the idea that what we are doing is correct and we simply need more people doing it. The problem is posed as quantitative. Often this assumption is correct, and thus mobilisation can be successful. For instance when picket lines form, getting as many workers and students mobilised to support and respect them is vital. However mobilisation can become an end in itself, leading to ritualised activity: what we want to suggest is that the quantitative problem of numbers may reflect a qualitative problem of the character of our activity. To understand this, we need to look at two concepts of unity; political and practical. Both have been present in the occupation, but both pull in opposite directions. Practical unity is what we showed when we sprinted in our hundreds to Bramber House, only to reassess and move en masse to occupy Arts A2. Practical unity is based on common interests – we all recognise that the victimisation of the Sussex 6 is illegitimate (even if technically lawful), and we all recognise that the cuts are an attack on us all. These views are widely held by students beyond those present on the day. This practical unity stands in opposition to political unity. Political unity is based on perceived lowest common denominators and the logic of ‘coalition building’, putting aside or ignoring political differences in order to create a popular front. The problem here is twofold; firstly the emphasis on unity can act as a block on critical discussion and self-reflection of tactics and strategy, secondly it can take us into the comfort zone of leftist shibboleths that we imagine to be popular but in fact are simply populist. For example, three speakers in a row yesterday denounced the “fascist BNP”. It is not important to discuss here whether the BNP are fascists, what is important is that they occupy the symbolic role of an evil that we can all unite against. The problem is this kind of political unity is both shallow and devoid of class content – Michael Farthing and Lord Mandleson would oppose the BNP too. 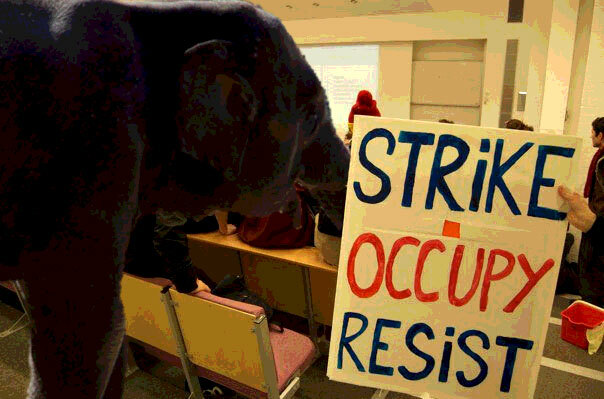 Having encouraged Uni staff to risk their jobs by joining the occupation – some were even contemplating staying the night – they were yesterday confronted by something more resembling a political rally. For seasoned leftists/activists this is unremarkable or even unnoticed. For many of those outside this ghetto it was a profoundly alienating experience. Mobilisation is a one-way process that want to make others more like us. If students don’t agree with us they should. If they do, they should get active, join us in demonstrating and chanting slogans. This certainly has its place in the campaign. But when mobilisation is posed as the answer per se it requires a popular front/political unity, suprressing critical reflection and in turn leading to ritualised activity undertaken regardless of its tactical or strategic merits. It's easy to mistake criticism and debate for disunity if the unity sought is political. Beyond the one-way logic of mobilisation, we want to propose a two-way logic of massification. The unity we seek is a practical one; political disunity must be recognised, nay encouraged, thus contributing to an ongoing culture of critical debate. Massification means not simply mobilising greater numbers of passive supporters, but also reflecting on what it is in our own activity which has thus far separated us off from that passive support as an activist minority. It means not just chanting, but listening. Talking to staff and students and engaging in two-way dialogue – seeking a unity based on common (i.e. class) interests not common politics. There have been attempts at this, some students have been talking to cleaners, porters, security and a representative of the cleaners spoke at the occupation yesterday morning. There have also been attempts to engage with student criticisms through the Q&A. Many of those who would feel singled out by the criticisms of mobilisationism can take credit for some of these activities. This is not a criticism of individuals or groups but of strategy. If we are to not just win the reinstatement of the six but stop the cuts we need mass activity. But rather than viewing this as just a problem of mobilisation – getting people to act more like us – we need to see it as a problem of massification – drawing in more people whilst also rejecting our own separation from other students and workers in this role of ‘activists’ which we have found ourselves occupying. This is really good, is there a pdf? Needs some development of the points it makes, as it is too short to really be clear. I also think that the use of "practical unity" is problematic in some ways. Anyone claiming that their approach is the 'practical' one is automatically suspect because by it very definition it precludes debate and since this was a point you were making, it is confusing. Also its use here seems to be equating what a group did in the active process of occupation with passive support of students and staff against the cuts based on the fact there was no 'political unity' in both situations. I do think that there's an error in the dichotomization between practical and political unity, for instance most counterarguments would center around the fact that practical unity implies some amount of political unity (maybe that's what JC is saying?) For me the central question is what amount of political unity? IMHO more conservative socialist parties often denounce as propagandistic attempts to get a coalition to adopt a radical line (something I and I think the authors of this piece agree is unproductive) but fail to do the same to liberal elements because that is construed as where the "people are at". I think what's bad about the situation we're all familiar with ("DOES THIS COALITION STAND AGAINST IMPERIALIST WARS OR NOT?!") is NOT the radical politics involved but exactly what the authors are critiquing, namely the emphasis on political unity which in practice often means homogenizing differences in the rightward direction. In AS we sort of analyzed some related problems(much more lengthily for the JCs out there!) here, I'd be interested to know what the authors of this piece think. I also think that the use of "practical unity" is problematic in some ways. Anyone claiming that their approach is the 'practical' one is automatically suspect because by it very definition it precludes debate and since this was a point you were making, it is confusing. well what it's getting at is that you can say, go on strike with your fellow workers without any political agreement - often co-workers are religious, sometimes racists, sexists etc, or politicos such as Trots, tory voters etc. the unity is one based on shared class interest (a point also made in the article). now you could argue this represents a form of implicit political agreement (and i'm amenable to the argument class struggle is always a contestation of power, i.e. political), but clearly it's not political unity in the popular front sense. now it's true groups can claim to be 'practical' as a mask for their suspect behaviour, but groups can claim to be anything - practical, revolutionary, communist, socialist... leftists will always by their very nature drape themselves in radical robes. similarly, those accusing others of sectarianism are usually those trying to deflect criticism of their sect putting their own interests above the struggle. i don't think there's a one-size-fits-all answer to this, it's probably a problem that will be there as long as capitalism persists. yeah that's what i was getting at. i think in any large scale struggle political disagreements are inevitable. i mean the most ideologically homogenous struggles i can think of would be in Catalonia in the 30s where hundreds of thousands of workers subscribed to anarchist ideals, but even then they never really solved the problem of how to work with those who didn't (in the UGT etc), not to mention the bitter differences within the CNT, and ended up in a popular front via lowest common denominator political unity (the committee of anti-fascist militias etc). so i think the thing to do is embrace the reality of political disunity and organise accordingly, letting the disagreements be a driving force behind tactical discussions and a defence against ideological ossification (i.e. if ideological prescriptions aren't working, they get argued against and rejected in assemblies etc). my personal 'if only' view on Spain is that something like this was the alternative to the popular front - councils consisting of all workers (CNT, UGT, non-union etc) arguing it out, taking advantage of the fact that in a struggle the rank and file of organisations are usually in advance of their leadership (formal or otherwise). I do think that there's an error in the dichotomization between practical and political unity, for instance most counterarguments would center around the fact that practical unity implies some amount of political unity (maybe that's what JC is saying?) For me the central question is what amount of political unity? yeah, this was a criticism made by a comrade at the time too. i accept there's an implicit political unity simply by virtue of the discussion taking place within a space occupied in defiance of the high court, meaning people who reject unlawful/illegal direct action were unlikely to be there in the first place. the reason i talked about 'practical' unity is that when i've worked well alongside leftists has been doing practical stuff - such as supporting the Vestas occupation last year with street collections etc. the problems surfaced when the practical activity subsided (with the end of the occupation), and thus 'political' disagreements that were manageable before (such as the workers' demand for nationalisation which divided the leftists and communists) came to the fore. now don't get me wrong, i think this kind of lowest common denominator practical unity is itself problematic on a permanent basis (e.g. the way rank-and-filism is limited to being militant trade unionism rather than challenging the trade union form itself), hence i'm an anarcho-syndicalist and think revolutionary workers should organise themselves (since a lack of day-to-day libertarian organising is part of the reason lefists are able to swoop in when struggles kick off and co-opt them, something they're less able to do if there's an established culture of resistance according to libertarian norms). I think what's bad about the situation we're all familiar with ("DOES THIS COALITION STAND AGAINST IMPERIALIST WARS OR NOT?!") is NOT the radical politics involved but exactly what the authors are critiquing, namely the emphasis on political unity which in practice often means homogenizing differences in the rightward direction. yeah, the whole 'where people are at' thing is the typical populist canard, and often completely wrong. the beauty of struggle is that people change their perspective very rapidly ('history speeds up' to quote a Marcos-ism) and typically overtake their (formal or informal) leadership. i think the task is not therefore to build broad lowest common denominator coalitions but create the spaces where such discussions/development can happen (where of course we make our arguments). these spaces could be workplace meetings on a lunch break or in the pub, mass meetings on a picket like, or assemblies in an occupied space (non-exhaustive list). i think the role of revolutionary organisation* is to facilitate and/or organise this, which is the diametric opposite of the vanguardist practice of erecting coalitions to lead (i.e. to create the conditions for self-organisation rather than purporting or desiring to represent the struggle or manage it on others behalf). Good piece with a valuable insight that was proven in struggle... I certainly learned from it. I have to agree with Jason Cortez's criticism about "practical unity" though. I understand the concept but the word choice seems wrong. Instead it would be better to call it "unity of interests" or perhaps "unity of goals." That's my two cents.